Halloween is a much-anticipated holiday for families. Parents get to see their children dressed up in adorable, creative, and unique costumes. And the kids, well … candy. But it can also be a stressful day for families, since there are a number of safety concerns that grow as the Jack o’ Lanterns are lit. 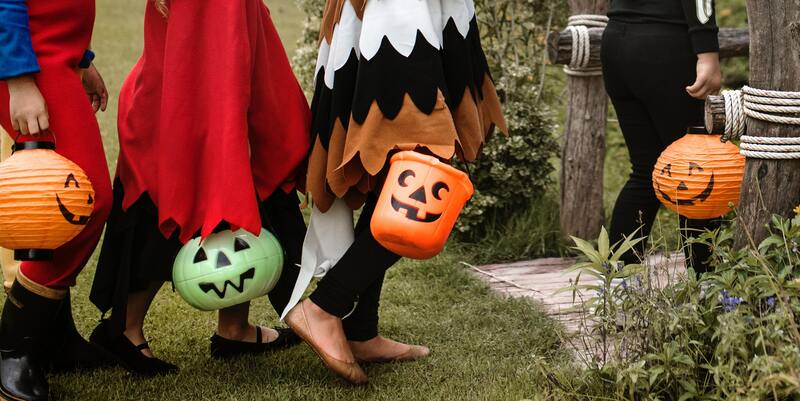 There are an estimated 3,800 Halloween-related injuries each year in the United States, yet 65% of parents don’t discuss Halloween safety with their children. Don’t take any chances this year. Here are 8 Halloween safety tips for your family to have a safe and fun day. This may sound obvious, but 12% of children under the age of 6 in the United States are allowed to trick-or-treat alone. If your child is young, make sure they are accompanied by an adult. If your child is old enough to not need parent supervision, make sure they are walking with a large group and stay within familiar areas. Have a discussion with your children about where they will be trick-or-treating. Even if you don’t establish a set route, you can give them general boundaries and tell them what places are off-limits. Keeping your children in a close radius to your house and away from busy main roads reduces the likelihood that they will get lost or have an incident. 3. Be cautious around cars. Your children probably already know to look both ways before crossing the street, but it’s important that they take extra precautions on Halloween when there are more pedestrians and there’s a higher chance of someone driving after consuming alcohol. Have them make eye contact with drivers before crossing the street so they know the were seen. Also, remind children–and adults alike–to put their phones down and keep their eyes on the road when they walk. 4. But be just as mindful as a driver. It’s not just the pedestrian’s responsibility to keep trick-or-treaters safe. As a driver, use extra caution on Halloween. Be mindful of speed limits and stop signs, taking extra time to observe intersections for children. It may not be possible to avoid driving during peak trick-or-treating hours, but try to limit unnecessary driving as much as you can. 5. Get creative with costumes, but be safe. Costumes can be creative and fun, while also keeping your kids safe. Use face paint instead of masks whenever possible, to give the costume a personalized look while also keeping your child’s vision unobstructed. Incorporate reflective tape, light colors and glow sticks into the costume that help their costumes stand out as well as help them be seen by drivers. 6. Check your children’s candy basket before they eat it. This is the oldest Halloween safety rule, but still one of the most important. Only allow your children to eat candy that is still completely sealed, and immediately discard candy that’s open, unsealed or damaged. If there is any doubt, stay on the side of caution–there will be plenty of other candy to enjoy! 7. Be mindful of what you give out. It’s estimated that 1 in 13 children has a food allergy. Make sure you are giving out treats that are in sealed packages to avoid any possibility of triggering an allergic reaction. If your child has a severe food allergy, be sure to carefully check their candy bag before they eat anything. 8. Know what’s going on at your home all day, and always. If you’re at work or taking your kids trick-or-treating, you still need a way to know what’s going on in your home to keep it secure. HomeSecure lets you keep one foot in the door no matter where you are. The mobile app lets you see what’s going on, control locks, lights and other connected aspects of your home, and gives you real-time alerts of security threats or issues. HomeSecure helps you protect the people and things you love the most, on Halloween and always.